Where do I drop off food drive donations? Food Drive donations may be dropped off at our location: Parkway Storage, 1535 Pickering Parkway. Please buzz the office on the keypad at the main gates and their staff will direct you to the drop off area. Monday - Friday 8:00 a.m. - 8:30 p.m.
Saturday - Sunday 9:00 a.m. to 4:30 p.m.
Where can I drop off individual items? 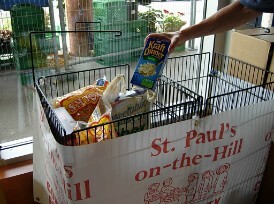 Many local grocery stores have collection bins located prominently in their stores. When you are grocery shopping, please consider including food for the food bank and drop your donations in the bin on your way out. For larger donations see above. 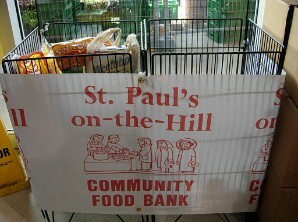 The food bank accepts all non-perishable items. Please ensure that donations are in good condition and not past expiry or best before dates. We also accept personal hygiene products, household cleaners and paper products. If you are not sure what to donate, contact us and we will be happy to advise you or check the Current Needs page on this site. Financial donations are gratefully appreciated. All money raised is used to cover general operating expenses which include rent, telephone, equipment upgrades and improvements. 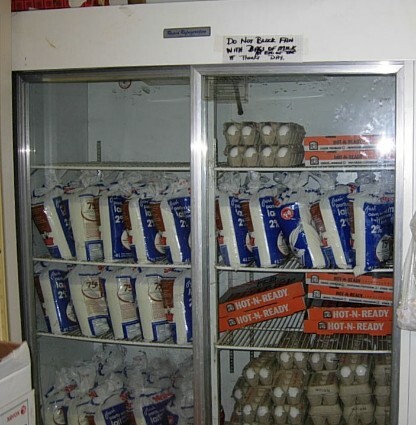 The food bank also provides fresh milk and eggs for our clients every week and we purchase any food items needed between food drives. The food bank is staffed entirely by volunteers; there are no paid staff. 100% of funds raised are used for food bank operations. Tax receipts will be issued for donations exceeding $10. Donations received AFTER December 15th will be issued a tax receipt dated the next fiscal year. (regardless of the cheque date). If you prefer, you may make a donation on-line through PayPal here.